Due to the inherent toxicity and addictive qualities of alcohol, it's use in the treatment of high cholesterol and cardiovascular disease is quite controversial. However, it is now clear that moderate alcohol consumption may actually be good for you. While it has taken years for our collective consciousness to permit this bit of heresy, not only have researchers verified this bold claim but they have uncovered some of the scientific basis for this benefit of alcohol on cholesterol and cardiovascular disease. How much alcohol for cholesterol and cardiovascular improvement? Is Red Wine Special in beating off cholesterol, heart disease and cardiovascular disease? Red or Purple Grape Juice instead of alcohol, or alcoholic wine, for heart and cardiovascular wellness? …And What Will You Have To Drink? There are three main players in the cholesterol game: LDL, HDL and triglycerides. LDL is sometimes called ‘bad cholesterol’ because when levels of LDL get too high, it is associated with several health problems such as heart disease, atherosclerosis and stroke. HDL, in turn, took on the moniker of ‘good cholesterol’ because heart disease risk increases when HDL levels are too low. It is quite common for both LDL to be too high and HDL to be too low thus greatly increasing the risk of cardiovascular diseases. Triglycerides have somehow avoided an epithet however they do need to be kept below a certain level. 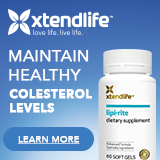 Therefore, in order to maintain the health of heart and brain, doctors are in a constant struggle to keep patient’s HDL up while keeping LDL and triglycerides down. Since the 1970s researchers were confounded by what had been dubbed the French Paradox. How could a culture that eats relatively large quantities of saturated fats and drink wine almost daily have relatively few people with heart disease? Some argued that the petite portions of high fat meals were the explanation but others were not convinced. Perhaps it was alcohol that was somehow keeping cholesterol levels in check. The finding that captivated Westerners was that drinking a glass (or two) of red wine each day was associated with less cardiovascular disease. Maybe it is not just wine, perhaps it is all alcohol. Then research showed that alcohol may prevent stroke and even improve diabetes! Finally we, as a society, were being told that we could do something tasty and enjoyable and it was actually good for us. The message was captivating. Numerous studies have confirmed that modest alcohol consumption lowers the risk of mortality, that is dying from any cause. The effect is greatest when 6 grams of alcohol are consumed per day (about half a standard alcoholic beverage in the United States). At this amount of alcohol consumption, the decreased risk of death was 20 percent. From that point on, the more alcohol that you consume the risk of death increases so that by 40 g per day, the benefit is gone. Drinking more alcohol than that increases the risk of death. The astute reader will realize that everyone’s risk of death is 100 percent. The figures listed here were based on the time that the study was conducted. While the time of the studies vary, they usually span several years. Alcohol consumption campaigns did not follow; doctors are typically not inclined to promote what is believed by many to be a vice. Too many physicians have dealt with the consequences of alcohol abuse—both the effects on the body and mind, but also the damage that can occur to families and careers. If drinking alcohol is given the green light, then it better come with a user manual. If the party line is that alcohol is a good thing, the quantity and degree of benefit had better be certain. It must be clear how alcohol is exerting its benefit and can it be achieved by something that is less dangerous—something that is not habit-forming. Can doctors, in good conscience, recommend alcohol to their patients? This has not yet happened, nor is it likely to happen anytime soon. However the evidence in support of modest alcohol consumption is impressive. Why does moderate alcohol protect your life? Well, researchers believe it has a lot to do with cardiovascular disease. When doctors look at risk of myocardial infarction (heart attack) and alcohol, one to two drinks a day decreases heart attack risk, but consumption of more alcohol increases heart attack risk. The effect on stroke is similar—a little alcohol is good, but too much is bad. Given the strong link between cholesterol and these diseases, a reasonable place to begin to unravel the beneficial effects of alcohol was to look for a connection between alcohol and cholesterol. One way the alcohol achieves this is to make the body produce more HDL. It seems that alcohol can inhibit a protein (cholesterol ester transfer protein) which in turn makes the body think it needs more HDL. While it is fairly clear that alcohol does not reduce ‘bad cholesterol’ or LDL, it may prevent LDL from going on to injure blood vessels. One of the reasons that LDL in high levels is associated with heart disease is that it contributes to the inflammation and injury of blood vessels. Alcoholic beverages, especially red wine, can interfere with LDL’s attack on the blood vessels. 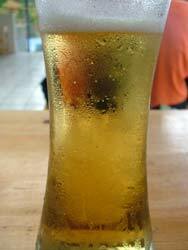 Alcohol also interacts with the third cholesterol player, triglycerides. At very low amounts, alcohol can reduce triglyceride levels to a small degree, but this benefit is quickly lost as the amount of alcohol consumed increases. The means by which modest amounts of alcohol protect against disease and improve cardiovascular health extends beyond its effects on cholesterol. It may also improve the way our bodies react to sugar. When patients with diabetes have a meal, the sugar (glucose) tends to stay in the bloodstream longer than it would in someone without the disease. 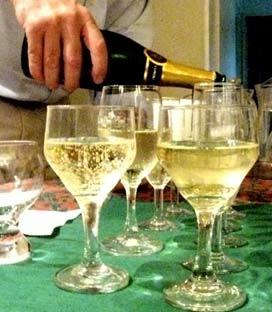 When diabetics drank a glass of wine with the evening meal, the glucose (sugar) from the meal is used more efficiently. Instead of leaving the glucose to circulate in the blood, the alcohol seems to help the body process the glucose, perhaps through increased metabolism. Modest amounts of alcohol seem to help the heart and blood vessels directly. For example, doctors can use a special CT scan to look for the presence of calcium in the blood vessels that supply the heart. The presence of calcium is an indication of inflammation and atherosclerosis. Apparently, one to two drinks per day was associated with decreased calcium in blood vessels around the heart (coronary arteries). The benefit was observed in peripheral arteries of the leg as well. In fact, modest benefit was detected in the carotid arteries which are the two main arteries that supply blood to the brain. This last finding may explain, at least in part, why modest alcohol can reduce the risk of stroke. Another marker of inflammation called C-reactive protein (CRP) is associated with heart disease i.e. high CRP equals increased inflammation and risk of heart disease. Not surprising, five to seven alcoholic beverages per week was associated with reduced amounts of CRP. Finally, a molecule that is integral to clot formation called fibrinogen, is reduced in people who drink small amounts of alcohol. Lowering levels of fibrinogen works to “thin” the blood ever so slightly thus reducing the likelihood of blood clots forming within blood vessels. There is a bit of a controversy when looking at alcohol, cholesterol and cardiovascular health. Many argue that red wine, and red wine only, is the beneficial alcoholic beverage. There is quite a bit of research to support this notion. On the other hand, there are many studies that show that cardiovascular benefit is seen in those that drink modest amounts of alcohol of any type whether it is beer, liquor, or wine (red, white or blush). Proponents of the latter position argue that it is much more important how much alcohol that you drink rather than which kind. Perhaps the compromise can be found in the things present in red wine other than alcohol. Red wine is known to contain some fairly powerful antioxidants not usually found in other alcoholic beverages. One of these compounds, called resveratrol, can perform any number of healthful feats on blood vessels and cells of the cardiovascular system. Interestingly, resveratrol is found in red grape juice as well, and several of the cardiovascular effects of red wine can be duplicated even when the alcohol is removed. There are a number of other beneficial chemicals found in red wine besides resveratrol. Other compounds with putative health benefits are the flavan-3-ols like pyocyanidins and proanthocyanidins. Quercetin and catechin are other red wine-derived antioxidant agents that are available as their own dietary supplements. Whether red wine confers more health benefits than other types of alcohol is unclear. What is clear is that no matter which alcohol beverage is consumed, the health benefits are lost with overconsumption. 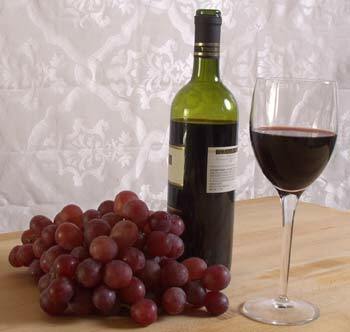 Red grape juice has many of the same antioxidants contained in red wine. It has resveratrol in fairly low quantities. It is fair to say that red/purple grape juice is a good source of antioxidants but need to be consumed in quantities about 2.5 times that of red wine - say 2.5 glasses a day. The common theme to all of these health benefits associated with alcohol consumption is that they all occur with moderate alcohol consumption which really should be described as minimal alcohol consumption. Once the number of alcoholic beverages passes one or two, the risk of a bad outcome increases considerably. For instance, the beneficial effect of alcohol on triglycerides is very narrow. This means that as little as three alcoholic beverages a day can increase triglycerides, which is unhealthy. Also, alcohol can increase blood pressure which, in turn, increases the risk for hemorrhagic stroke. Further, alcoholism is a real disease with real consequences. It is not always safe to assume that people will be able to drink only modest amounts of alcohol. While the mechanism is unclear, complex factors such as a person’s genetic makeup and psychological predispositions contribute to whether an individual will develop alcoholism. Unfortunately, medical science has yet to discover a way to predict who will and will not develop the disease which is why no major health organization is willing to advocate a program for people to start drinking alcohol. Annually, alcohol abuse is responsible for the deaths of 100,000 people in the United States and many more worldwide. Drinking alcohol to excess increases the risks of motor vehicle accidents, developing irregular and dangerous heart rhythms, liver disease, suicide and even some types of cancer. People can easily become dependent, if not addicted to alcohol and, when this occurs, the measly 20 percent reduction in mortality risk that modest alcohol consumption confers is long gone. Health organizations such as the American Heart Association take a proceed-at-your-own-risk stance. They recommend that if you currently drink alcohol that you should do so in moderation. Modest or moderate alcohol consumption means one alcoholic beverage for women and two for men per day. The definition of one drink can change considerably depending on your country of origin, but one drink is here defined as one 12 oz. beer OR 4 oz. of wine OR 1.5 oz. of 80-proof spirits. Other health organizations make similar recommendations. The AHA also recommends that if you do not normally drink alcohol than you should not start. Despite the compelling evidence that modest consumption promotes health in a variety of ways, the slope to compulsive drinking is steep and slippery. If you are not able to control your intake then drinking alcohol can become its own disease. Unfortunately, each person is their own worst bartender when it comes to tallying the amount of alcohol consumed. Therefore do indulge, but only if you do so in moderation, but better still, drink grape juice and don't give alcoholism a road in. Albert MA, Glynn RJ, Ridker PM. (2003)Alcohol consumption and plasma concentration of C-reactive protein. Circulation107:443–7. Caetano R, Cunradi C. (2002) Alcohol dependence: A public health perspective. Addiction 97:633-645. Emberson JR, Bennett DA. (2006) Effect of alcohol on risk of coronary heart disease and stroke: causality, bias, or a bit of both? Vasc Health Risk Manag 2(3):239-49. DiCastelnuovo A, Castanzo S, Bagnardi V, Donati MB, Iacoviello L, de Gaetano G. (2006) Alcohol dosing and total mortality in men and women. Arch Intern Med 166:2437– 45. Grant BF. (1994) Alcohol consumption, alcohol abuse and alcohol dependence: The United States as an example. Addiction 89:1357-1365. Greenfield JR, Samaras K, et al. (2005) Beneficial postprandial effect of a small amount of alcohol on diabetes and CV risk factors: modification by insulin resistance. J Clin Endocrinol Metab 90:661–72. Kloner RA, Rezkalla SH. (2007) To Drink or Not to Drink? That Is the Question. Circulation 116(11):1306-17. Mukamal KJ, Chiuve SE, Rimm EB. (2006) Alcohol consumption and risk for coronary heart disease in men with healthy lifestyles. Arch Intern Med 166:2145–50. O'Keefe JH, Bybee KA, Lavie CJ. (2007) Alcohol and cardiovascular health: the razor-sharp double-edged sword. J Am Coll Cardiol 50(11):1009-14. Opie LH, Lecour S. (2007) The red wine hypothesis: from concepts to protective signalling molecules. Eur Heart J 28, 1683–1693. Sacco RL, Elkind M, Boden-Albala B, et al. (1999) The protective effect of moderate alcohol consumption on ischemic stroke. JAMA 281:53–60. Sierksma A, van der Gaag MS, Kluft C, Kendriks HFJ. (2002) Moderate alcohol consumption reduces plasma C-reactive protein and fibrinogen levels; a randomized, diet-controlled intervention study. Eur J Clin Nutr 56:1130–6. Vliegenthart R, Oei HHS, et al. (2004) Alcohol consumption and coronary calcification in a general population. Arch Intern Med 164:2355–60. van Golde PM, Hart HC, Kraaijenhagen RJ, et al. (2002) Regular alcohol intake and fibrinolysis. Neth J Med 60:285-288.